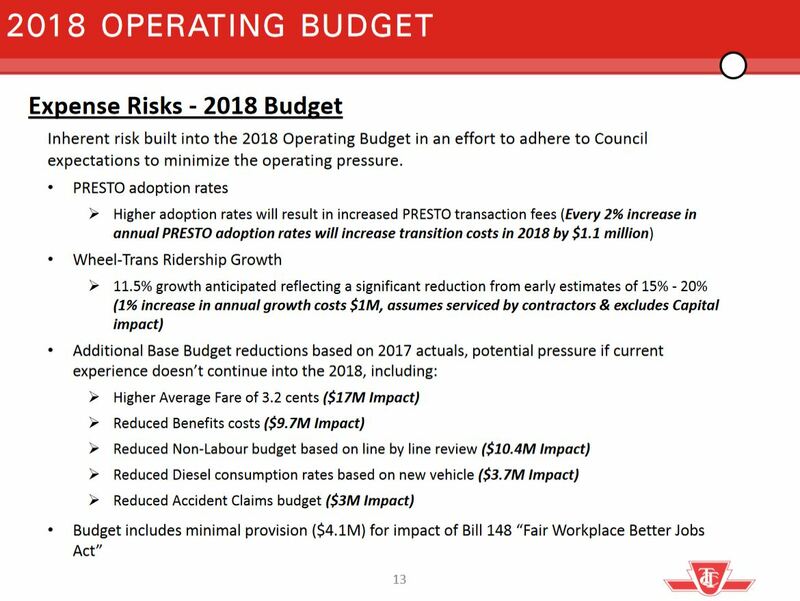 The TTC Budget Committee met today and considered the draft 2018 Operating Budget. Between the original release (described later in this article) and today’s meeting, Mayor Tory and two members of the TTC Board endorsed the concept of a two-hour fare to replace the complex transfer rules now in place. Although this was listed as the second item on the revised meeting agenda, Commissioner Mary Fragedakis moved that it be considered first. This re-ordering was a procedural move to forestall a standard tactic used at City Council where a motion setting the next year’s tax increase is introduced and passed before the budget which it will fund. The result is that any proposed budget changes must fit within the already-approved tax level rather than having taxes set after the budget is finalized. In this case, the motion regarding a two-hour fare was only a report request, and the order was less critical. That request passed by a vote of 3-1 with Budget Chair John Campbell in the negative as he opposes the two-hour fare scheme. The meeting then turned to a series of deputations which, as these things tend to do, fell on largely hostile ears. A favourite tactic is to challenge members of the public to explain “how would you do it”, despite the fact that the issues are complex and do not fit within an answer of a few sentences. The Budget Committee itself cancels more of its meetings than it holds, and opportunities for an open debate about transit policy options and the budget rarely occur. Beyond information already in the budget report, there were a few additional items of note in the staff presentation. This comes up from time to time, and it is clear that the Committee did not fully understand the costs and revenues associated with the extension. For some time, a cost increase of $30 million annually has been cited for the TYSSE. However, the 2018 Budget only includes a $25 million bump because $5 million had already been included for start-up costs and operation in the 2017 Budget. The $25 million comes from a combination of new costs, and revised revenues. The TTC now receives $8 million for bus services operated on contract for York Region, but those services will be assumed by the Region when the subway extension opens. 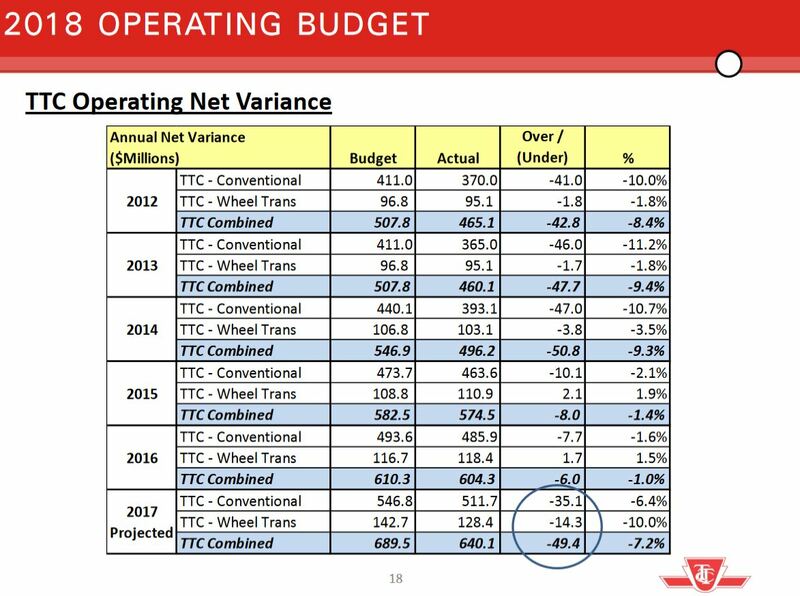 The TTC will continue to operate the vehicles, but now at their own cost and so this is a net increase in costs because of the lost revenue. That amount is partly offset by a combination of $3 million in new fare revenue and $1 million in parking revenue. Note that most of the expected ridership on the TYSSE will be by existing riders changing travel patterns, not by net new riders. This is further constrained because York Region Transit will continue to serve York University directly thanks to a lack of agreement on a co-fare between YRT and TTC. Riders who were anticipated to show up as YRT-TYSSE-YorkU trips will not be using the subway. It is ironic that there will be more new rides by children on the system as a whole than by riders on the subway extension. This provides the net increase of 3 million over 2017 probable results. The budget has been drawn up on a conservative basis and leaves several areas where the outcomes in 2018 could be different than projected. The $14 million now sitting in the Transit Stabilization Reserve could be used to offset some of this risk, provided that Council does not scoop the reserve simply to hold down the subsidy increase. Some of the items below refer to savings that allowed 2017 to show a “surplus” (actually a reduced requirement for subsidy), and these might not all continue into 2018. The budget contains a provision for $4.1 million in extra costs through the provincially mandated payment for two emergency leave days per year. This has been estimated conservatively, and TTC staff advised the Committee that the worst case cost could be $18 million. 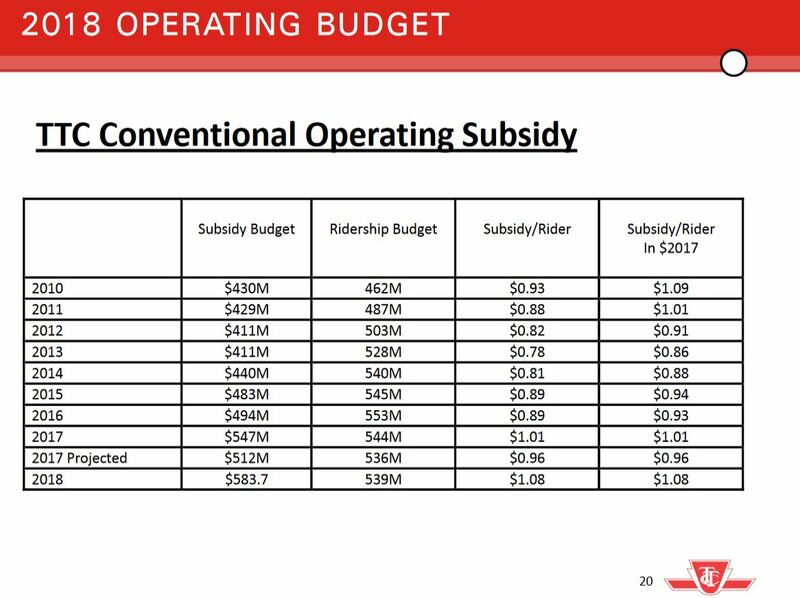 For many years, the TTC has consistently come in under budget for the annual subsidy requirement. In the table below, the amounts are for the subsidies, not for the overall operating costs. This always leaves the TTC in a position for its next year estimates that a budget-to-budget subsidy flat-line actually represents an increase over actual requirements in the current year. The subsidy per rider will go up in 2018 because of the fare freeze. Although this takes Toronto back to the level of 2010, that does not allow for cost inflation over that period which has been well above the CPI. The December schedules bring the opening of the Spadina subway extension to Vaughan Metropolitan Centre Station and a major reorganization of bus routes along the subway corridor. Bus routes will be reorganized to serve the subway stations, and in some cases services will be split at the subway corridor. 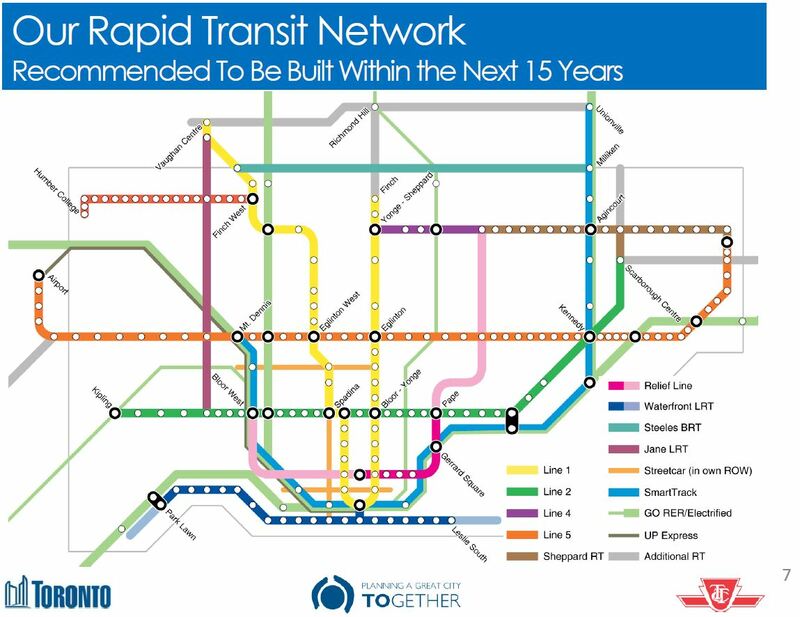 The map below is taken from the TTC’s project page for the line. Services north of Steeles Avenue that were formerly operated by the TTC on behalf of York Region under contract will now be run by their own transit agency. Fares on the subway have yet to be integrated with YRT, and so a TTC fare will apply to subway journeys while a local YRT fare will apply to the bus feeder network. This is the subject of ongoing discussion, and as usual the issue is who will pay to subsidize a lower co-fare between the two agencies. 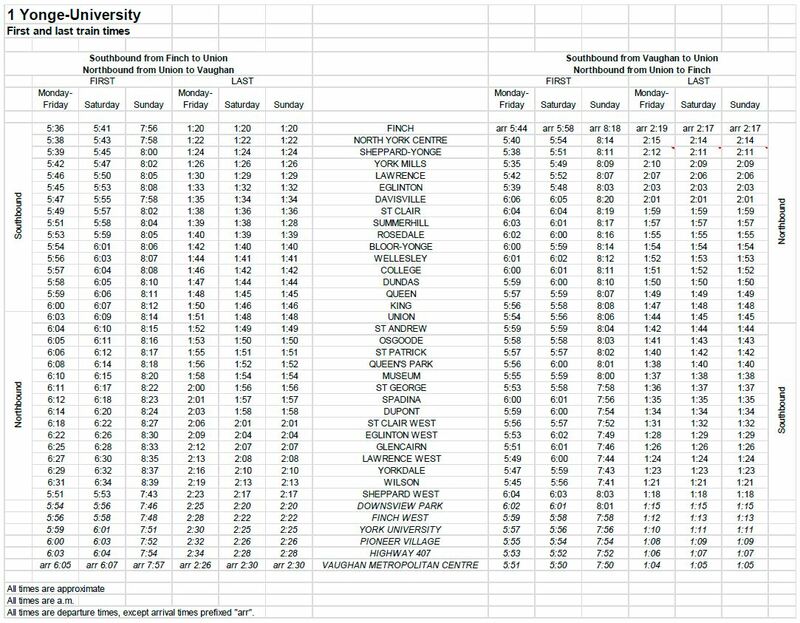 The subway will continue the same hours of service it now provides, and the new first/last train times are shown in the table below. The first train of the day inbound from Vaughan will be at about 5:50 am except on Sundays when service begins at 7:50. The late night schedule is driven by the long-standing meet at Bloor-Yonge between outbound trains to Finch, Kennedy and Kipling stations at 1:54 am. The last inbound train from Vaughan will leave just after 1 am, and the last outbound train will arrive at about 2:30. Service on the bus routes affected by the subway is generally at levels similar to what operates today with only a few exceptions. 35 Jane and 195 Jane Rocket: Extended to Pioneer Village Station (Steeles). 36 Finch West: Route split at Finch West Station (Keele & Finch) during most operating periods. Peak service west of Keele Street improved. Service east of Keele will be reduced in many periods recognizing that many riders will not ride east of the station. 41 Keele: Local service extended to Pioneer Village Station. Express service terminated at Finch West Station. 60 Steeles West: Service reorganized to focus on Pioneer Village Station rather than York University. 84 Sheppard West: Peak period Oakdale service extended to Pioneer Village Station. 84E express from Yonge to Sheppard West Station replaces 196B York University Rocket. 106 Sentinel: Formerly named 106 York University. Extended to Pioneer Village Station. 107 St. Regis: Formerly named 107 Keele North. York U service rerouted and extended to Pioneer Village Station. 108 Driftwood: Formerly named 108 Downsview. Extended to Pioneer Village Station. 117 Alness-Chesswood: Formerly named 117 Alness. Rerouted to better serve the area west of Dufferin Street. 196 York U Rocket: Replaced by the subway extension. 199 Finch Rocket: York U branch cut back to Finch West Station. 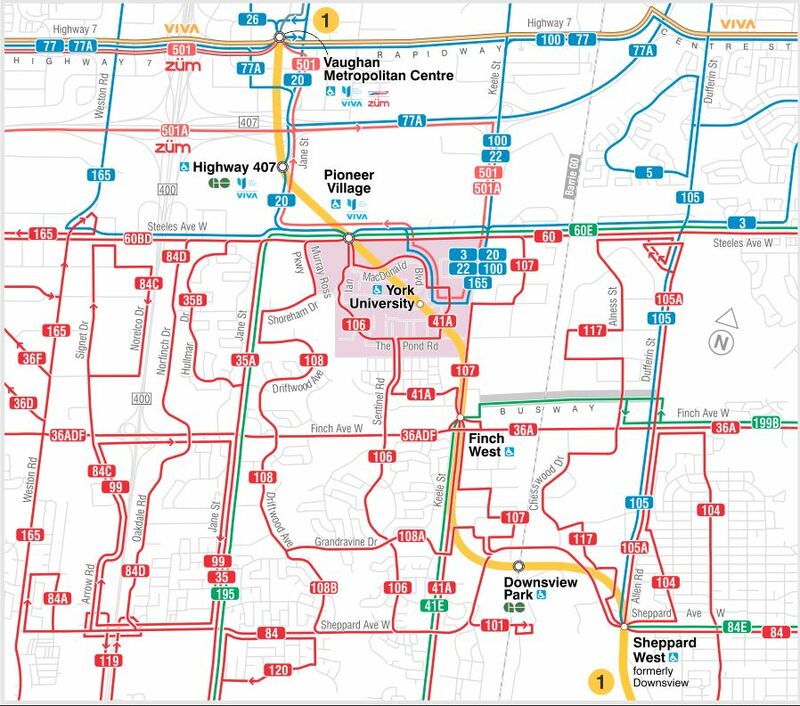 Night service will be provided to the York U ring road by 335 Jane, 341 Keele and 353 Steeles. The 336 Finch bus will not serve Finch West Station. Service on many surface routes and on Line 2 Bloor-Danforth will operate with summer schedules from Monday, December 18 to Friday, January 5. Extra school trips will not operate. Christmas and New Year’s Days will operate with Sunday service including the 8:00 am opening time for the subway. New Year’s Eve service will be extended on many routes until roughly 4:00 am with extra service on the subway. Regular service resume on Monday, January 8, 2018. Service is expected to operate free after 7:00 pm as in past years, but the details have not yet been announced. The last train meet at Bloor-Yonge for outbound service will occur at 3:37 am rather than the usual 1:54 am. The last trains on 4 Sheppard and 3 SRT will wait for the last trains on 1 Yonge and 2 Bloor-Danforth respectively. 501 Queen will divert via Church, King and Spadina after 11:00 pm for festivities at City Hall. 509 Harbourfront will have extra service every 9 minutes until 2:00 am and every 15 minutes thereafter. 510/310 Spadina will have extra service every 6 minutes until 1:30 am, every 8 minutes until 3:00 and every 12 minutes thereafter. Gap and standby buses will be provided downtown and at other locations to provide extra service as needed. Contract service outside of Toronto on 52 Lawrence West, 129 McCowan North and 68 Warden will be extended to 4:00 am. Service on 160 Bathurst North, 17 Birchmount and 102 Markham Rd will end at the usual time. The November 2017 schedules bring only minor changes, with one big exception: trains on Line 1 will begin operating to Vaughan Metropolitan Centre Station, albeit as “ghosts” for training and testing. Revenue service will begin, using the same schedules, on Sunday, December 17, 2017. The revised subway schedule preserves existing headways, more or less, including the AM peak short turn at Glencairn which is not being extended further north. Service beyond Glencairn in the AM peak will operate every 4’42”. In the PM peak, it will operate every 2’36” with no short turn. Queen streetcars return between Neville and Sunnyside with no diversions. A date for return of service at least to Humber has not yet been announced. Service beyond Humber to Long Branch is planned for mid 2018 due to ongoing road reconstruction on Lake Shore Boulevard. Please see my article on the Queen West projects for more details on the status of this work. The December 17, 2017 schedules will appear in a separate article. They include all of the surface route changes associated with opening the Vaughan subway extension, as well as plans for special schedules over the holiday period. Back in the early days of John Tory’s mayoralty, the 2015 budget discussions were overshadowed both by the legacy of the Ford administration and by major issues with project control at the TTC. From the Ford years, Tory inherited a mean-spirited attitude to transit spending and service cuts that the new mayor would come to reverse, for a time at least. A bigger issue, however, was the matter of runaway spending by the TTC on two major projects: the Spadina subway extension (aka TYSSE) and the resignalling contracts for the Yonge-University-Spadina subway (aka Line 1). Even while the TTC’s CEO was coming to grips with these projects, Council passed a motion asking for a review of how the TTC was managing its business. c. future organizational options for Transit project management and delivery of Major Capital projects related to Transit expansion and major State of Good Repair projects. In the fullness of time, considerably later than the November 2015 date in the motion, a report from KPMG landed on the TTC Board’s agenda, the TTC Capital Program Review. This was supplemented at the meeting by a presentation from KPMG and a response from CEO Andy Byford. The terms of reference for KPMG’s work were somewhat different from the Council motion. Item “a” of the Council motion asked for a comparison of actual costs and completion dates with original plans. KPMG does not provide this information, and even worse, included a table of selected projects that does not clearly explain their history (see below). There is no “deep dive” into any of the projects and, therefore, no specifics that could be tied to “lessons learned”, to practices that created the problem in the first place. The table below is the closest the report comes to commenting on Council’s request, but read in isolation it can be misleading. It is ironic that in their presentation to the TTC Board, KPMG did not include this table and made no comment on it. CEO Andy Byford was not so kind, and emphasized that most of the scope changes were perfectly legitimate. Two of these (track and paving) are the only “Ongoing” programs reviewed by KPMG. These are fundamentally different from “Finite” projects such as the construction of a line or the retrofit of elevators to stations. I will return to this distinction later. This is a dangerous table in that it shows an apparent growth from $5 billion to almost $8 billion in project costs, a 60% increase. That was the easy headline in media coverage of this report, and the sort of simplistic comparison that some members of Council would seize on as symptomatic of “waste” at the TTC. Scope change appears as a “primary cause” in five of these projects, but not all such changes arise from the same circumstances. 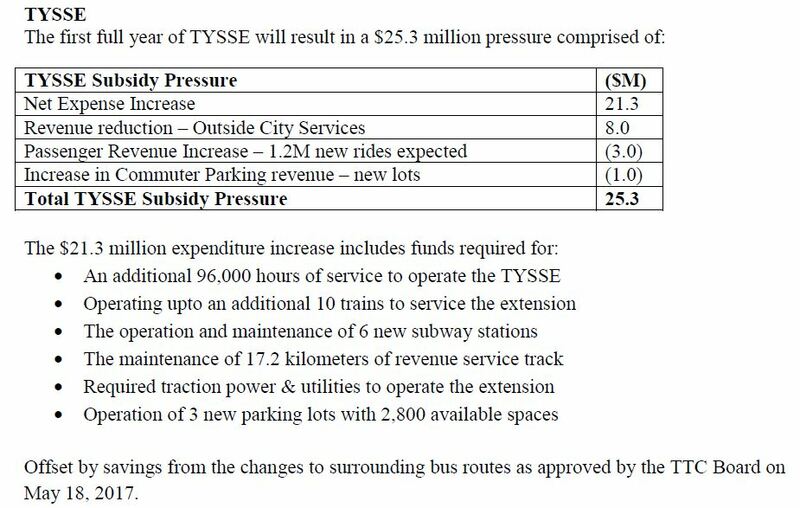 TYSSE’s cost grew due to inflation between the original estimate and the eventual approval of the project, and of course because the line was extended from York University to Vaughan Centre. There was a considerable delay between the approval and actual start of work thanks to foot-dragging by senior governments in finalizing their contribution agreements. No adjustment to the completion date nor allowance for inflation was added to the estimate. Politicians along the line wanted showcase stations, not the standard TTC boxes, and much of the contingency in the project’s budget was consumed by unexpectedly high bids for these structures. The TYSSE project suffered from poor organization with many contractors on competing deadlines. This arose in part because the prevailing wisdom at the time was that work should be parceled out in small enough pieces that multiple mid-size contractors could bid. This arrangement was more a political decision than a technical one. The original project did not foresee a conversion to Automatic Train Control (ATC) because that was not part of the TTC’s plans at the time. This item was added after the fact under a separate project budget, but this work added yet another layer of complexity to overlaps between many subsystem installation contracts. The original fleet plan for TYSSE included the continued use of a portion of the older T1 fleet on the YUS with most, but not all, of the trains coming from the new TR order. After the decision to implement ATC, the T1s were no longer suitable because of the high cost of retrofitting ATC to them, and the TR contract grew accordingly. The TTC has a surplus of T1s, but no place to use them, including the proposed Scarborough subway which will also have ATC. The planned opening date for the SSE occurs well before the planned completion of the replacement of the T1s, a project that will have to be accelerated shifting spending into earlier years than planned. The TTC now has a much larger subway car fleet than foreseen a decade ago thanks to the T1 surplus and cars for improved service under ATC that will not actually be used until 2019 and beyond when the ATC project completes. Additional space will be needed for the T1 replacements that will require concurrent storage space and a significantly different carhouse design from Greenwood Shops. These projects are not yet funded, and are not fully included in the cost estimates for the SSE. The TR purchase, like all TTC vehicle contracts, includes a base order plus an option for additional vehicles. This is a standard arrangement for procurement because the TTC never receives full funding for its plans in one go, and circumstances change causing quantities to go up, or occasionally down. The complete order now includes enough trains for the complete replacement of non-ATC capable trains on YUS, conversion of the Sheppard subway from T1 to TR operation, the Spadina extension to Vaughan and additional trains to run more frequent service once ATC is in use on YUS. The ATC contract evolved out of a dog’s breakfast of plans for new signalling on the YUS. Originally, the plan was simply to replace the aging block signal system on the original part of the line. However, funding for this could only be obtained by misrepresenting necessary maintenance work as something that would enable additional capacity. Eventually, the project grew to have at least two overlapping technologies being installed at the same time so that non-ATC operations could co-exist on an ATC line. This proved unworkable, and the contracts were consolidated into a single ATC project. The extra costs are a direct result of, first, underscoping the project for political reasons, and later from a failure to appreciate the technical complexity of what was being attempted. The above are only the high points of a much more complex history (available in the linked articles), but what should be evident is that major projects interact with each other even though they are almost always discussed as if they are completely separate entities. This is a major problem in TTC budgeting and in the political context where such projects are debated. KPMG hints at this problem in its review, but does not drag any details out into the open. The following discussion can only touch on the full report of 273 pages, and is intended to place the report more in the political context of the TTC Board and Council (and through them to the ongoing debates about TTC funding) than KPMG which tended to focus on internal issues of process. Updated August 15, 2016: The detailed table of service changes has been added to this article. September 2016 will see a return to the “winter” schedules on most TTC routes. Despite talk of service cuts in the budget process, the new schedules include some improvements to correct for operational problems on a few routes, and to better handle existing demand. The scheduled mileage for September is actually above the budget level due to greater than anticipated requirements for diversions and extra vehicles to deal with construction projects. The TTC Board will meet on January 21, 2016. Unlike most meetings, the public session will begin at 10:00 am, although they may go into camera to discuss details of item 3 on the agenda, the cost overrun on the Spadina subway extension. The CEO’s Report which has a new format and additional info starting this month. The report on the cost overrun for the Spadina subway extension which now requires an additional $400m in funding. The procurement of a new Computer Aided Dispatch / Automatic Vehicle Location system. The introduction of new express bus routes. This article has been updated with details on these subjects. The TTC Board received an update from City and TTC staff on the status of major transit expansion plans in Toronto at its meeting of September 28. The presentation was largely delivered by Deputy City Manager John Livey with backup from Mitch Stambler, TTC’s Head of Service Planning. Also at the table, but notable for her silence, was the Toronto’s Chief Planner Jennifer Keesmaat. A contingent from Metrolinx, another agency studying transit expansion, was in the public gallery, but they did not participate in the presentation or discussion. This session was a prologue for a report coming to Toronto’s Executive Committee on October 20, 2015, but a great deal of detail remains to be fleshed out. This proved frustrating for the Board members on two counts. 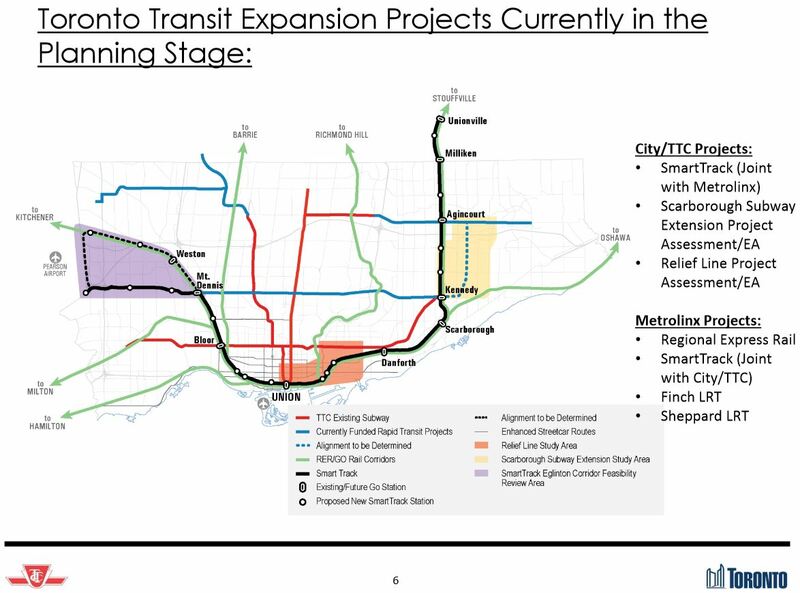 First, the lack of detail prevented the TTC from making informed comment on the plans, and second, the process itself has largely bypassed the TTC Board and concentrated work at the City and Metrolinx. To some extent, the TTC has itself to blame for this situation. During the Ford/Stintz era, meaningful policy debates at the TTC were rare, and the TTC ceded responsibility for large scale planning to the City of Toronto under Keesmaat’s department. At the political level, staying informed about issues is a comparatively new desire by Board members (not to mention some members of City Council) when the issues are more complex than a dumbed-down subways-subways-subways mantra. They have a lot of catching up to do. The situation is complicated by parallel work at Metrolinx, an agency with very different goals from the TTC and the City, and by the inevitable political wrangling over the relative importance of projects. Whether any reports coming forward from staff will be trusted, especially in an environment where Councillors and the Mayor routinely dismiss “expert” advice that does not suit their biases, remains to be seen. Equally difficult will be the question of whether the reports are spun, in advance, to suit specific outcomes rather than presenting “just the facts”. Draft results for the new projects and network will not be available until October 2015, and a report on details will not come to Council until the first quarter of 2016. One suspicion is inevitable given this delay: is the “calibration” intended to produce a desired outcome? That’s a tricky question both because it speaks to the independence of the process and also to the way in which the model is used. For example, a model may well reproduce past behaviour perfectly, but that’s a known target and the context for it (then-existing transit, road and land use configurations) are a matter of record. Future modelling depends not only on the nuts and bolts of the model itself, but of the assumptions put into its configuration. A well-known example of flawed modelling was for the Sheppard Subway in which unduly rosy assumptions about job numbers and locations gave the subway a projected demand well above what it actually achieved. The further one goes into the future, the cloudier the view becomes, and the presumed distribution of population and employment can involve political as well as basic economic dimensions. If, for example, the concentration of jobs in the core area and the polarization of high and low income housing concentrations continues, this has profound effects on future demand. Moreover, such concentration may not suit politicians who view their own turf as the rightful place for future growth.